In keeping with outstanding service to both commercial architects, major contracting companies as well as residential customers, our reputation is well deserved. 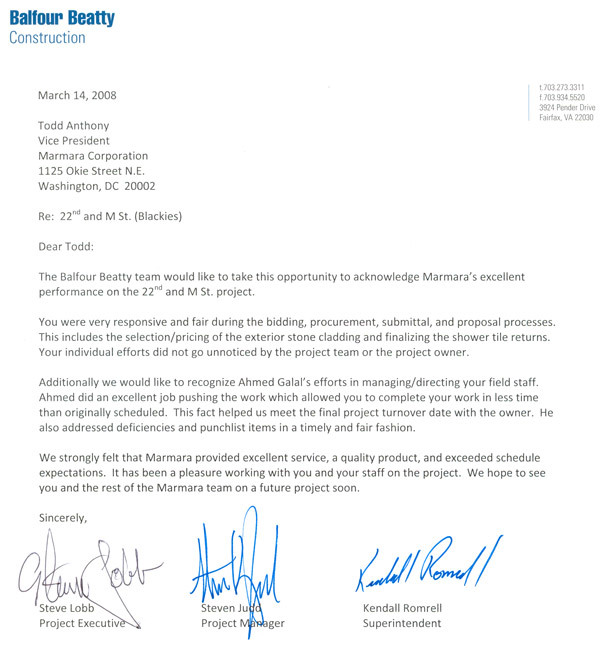 Here are a few examples, in their own words, of the many satisfied clients that Marmara Corporation has collected over the years. I would like to thank you and the entire Marmara staff for creating the home that I love. Your suggestions, fine craftsmanship and professionalism have made this process a true labor of love. I will always sing Marmara’s praises and highly recommend you to anyone who wants the finest materials installed by the finest craftsmen. You’ve gone the extra mile to personally accommodate my needs and create my dream home in a totally painless process. For this, I am sincerely grateful. I wanted to take this opportunity to let you know that it was a pleasure working with you on the Perseus Office Interiors project at 2099 Pennsylvania Ave. in Washington, D.C. Perseus is a beautiful design and I am fortunate to have had the opportunity to be a part of its construction. With such a short schedule and in a tight market, we all had our ups and downs throughout the job, but with your teamwork and efforts, the project was a success. Now that we are past substantial completion, I am confidant that with our continued team effort, the remaining punchlist and closeout will come to fruition quickly and successfully. Again, thank you for your efforts and we look forward to continuing our ongoing and successful relationship. Your firm just completed the Sheraton National Hotel for HITT Contracting. This project proved to be very difficult on many levels. I would like to commend your staff on the effort and expertise that they put forth in seeing the project to completion. Your team’s craftsmanship and dedication to the project helped HITT to successfully complete this project. The HITT team appreciates the effort Marmara put forth, and we are looking forward to future projects on which we can again join forces. On behalf of Green Door, thank you and Marmara Corporation for doing an excellent job of making repairs at our mental health clinic at 1221 Taylor St., NW. We were very pleased with how smoothly this quality job was done. The repairmen were wonderful by being careful and by being mindful of our concerns. We look forward to working with your company again. Thanks very much for a job well done. Again! The gentlemen who did the installation were very friendly and professional. It looks wonderful. I will be in touch soon to do the floor in my other bathroom. Yippee! My beautiful back-splash is finally installed! Here’s a pic for you! Doesn’t it look fabulous!? I love it! Thanks for your help and guidance! You did an excellent job on the tabletop, it looks great. Thank you for letting me take the table top and pay by check – I appreciate the courtesy. I wanted to let you know how happy I am with my new slate fireplace hearth. But even more, I wanted to let you and everyone at Marmara Corporation know how happy I was with the service I received. I realize I am a very small customer in terms of the amount of money and size of the job I was getting done. Yet you treated me with great consideration. I enjoyed looking at options in the showroom and warehouse and the time you spent explaining those options. Please thank Mr. Yozgat and everyone for such fine service from beginning to end. I will highly recommend your company to friends.